Some people think Jay-Z is just another rapper. Others see him as just another celebrity/mega-star. The reality is, no matter what you think Jay-Z is, he first and foremost a business. And as much as Martha Stewart or Oprah, he has turned himself into a lifestyle. You can wake up to the local radio station playing Jay-Z's latest hit, spritz yourself with his 9IX cologne, slip on a pair of his Rocawear jeans, lace up your Reebok S. Carter sneakers, catch a Nets basketball game in the afternoon, and grab dinner at The Spotted Pig before heading to an evening performance of the Jay-Z-backed Broadway musical Fela and a nightcap at his 40/40 Club. He'll profit at every turn of your day. But despite Jay-Z's success, there are still many Americans whose impressions of him are foggy, outdated, or downright incorrect. Surprisingly to many, he honed his business philosophy not at a fancy B school, but on the streets of Brooklyn, New York and beyond as a drug dealer in the 1980s. Empire State of Mind tells the story behind Jay-Z's rise to the top as told by the people who lived it with him- from classmates at Brooklyn's George Westinghouse High School; to the childhood friend who got him into the drug trade; to the DJ who convinced him to stop dealing and focus on music. 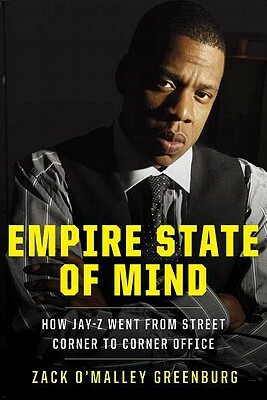 This book explains just how Jay-Z propelled himself from the bleak streets of Brooklyn to the heights of the business world. Zack O'Malley Greenburg draws on his one-on-one interviews with hip-hop luminaries such as DJ Clark Kent, Questlove of The Roots, Damon Dash, Fred "Fab 5 Freddy" Brathwaite, MC Serch; NBA stars Jamal Crawford and Sebastian Telfair; and recording industry executives including Craig Kallman, CEO of Atlantic Records. He also includes new information on Jay-Z's various business dealings, such as: * The feature movie about Jay-Z and his first basketball team that was filmed by Fab 5 Freddy in 2003 but never released. * The Jay-Z branded Jeep that was scrapped just before going into production. * The real story behind his association with Armand de Brignac champagne. * The financial ramifications of his marriage to Beyonce. Jay-Z's tale is compelling not just because of his celebrity, but because it embodies the rags-to-riches American dream and is a model for any entrepreneur looking to build a commercial empire. Zack O'Malley Greenburg is a staff writer at Forbes, where he has covered finance and music since 2005. Along the way he's profiled the likes of Akon, 50 Cent and Afrika Bambaataa; his stories have taken him from the casinos of Macau to the diamond mines of Sierra Leone. He has also written for The Washington Post, The Huffington Post, and Dan's Papers. He lives in New York City.